We one of the few ambulance providers which continue to offer "memberships" or "subscriptions". We have thousands of subscribers, and will continue to offer this program for our customers!! Yearly memberships to our service start as low as $10.00 and are no higher than $25.00 for a family with several dependent children living at home! When a "member" uses our services, there is no out of pocket expenses on your part for medically necessary ambulance needs. (doctors office visits excluded). We will bill your insurance carrier, and accept their payment as payment in full for services rendered. Should you be without medical insurance, we are unable to to provide you with "no charge" service due to federal guidelines, although you will be billed at the LOWEST RATES WE HAVE NEGOTIATED WITH INSURANCE PAYERS, which will offer you a SUBSTANTIAL savings over standard ambulance charges. An ambulance charge can range from $200.00 to as high as $900.00 or MORE! Each time you call for our ambulance services, we bill any insurance that you may have and any amount not covered by your health insurance coverage will be covered by your membership! No membership cards to contend with! You are tracked on our computer system by your social security number and advised by mail prior to expiration of your membership! We will send you a card, but you do not need to carry this card with you! No need to carry "one more card in you wallet" and no searching during an emergency for a lost card! Individual Membership $15.00 / Yr. Couple Membership $20.00 / Yr.
Family Membership $25.00 / Yr. Nursing Home Resident $10.00 / Yr.
• Unlimited ambulance usage, day or night! • Supports our ability to continue to provide fast, excellent service! 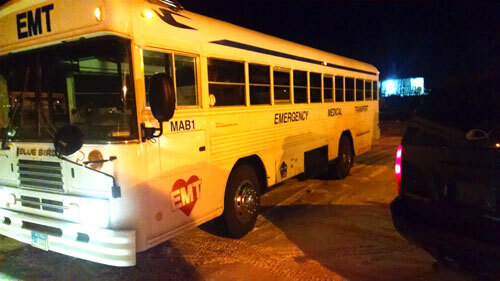 • Covers emergency & non-emergency ambulance transports! • No one is ever turned down regardless of medical condition! • Tracked on our computers system by Social Security Number. • Applications available at many local businesses or by mail request. • Email us & request an application & one will be mailed!